On the weekend of Saturday 18th July and Sunday 19th July 2009 Portsmouth Historic Dockyard hosted the Royal Navy Past and Present event. During the event HMS Daring, the Royal Navy's newest Destroyer was open to the public for the first time. HMS Daring is the first of six new Type 45 Destroyers being built for the Royal Navy. The event also featured the band of HM Royal Marines as well as physical training demonstrations. In addition to these special events all the regular attractions were open and crowds flocked to the event. There was also a display of over 300 model boats in the mast pond these ranged from 18th Century ships to modern day ships with a miniature Battle Of Trafalgar taking place. There were costumed re-enactors who helped bring the area to life. There was also Tudor entertainment and both days culminated with the Royal Marines Band performing the Sunset Ceremony. Thousands of people went to the two day event and it proved a huge success. On Friday 30th July 2010 Navy Days returned to portsmouth with ships being opened to the public, aerial displays, the band of Her Majesties Royal Marines and much more. To experience the event please see the photo gallery and video below. 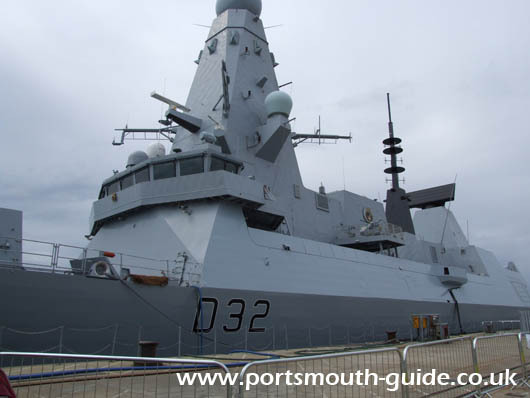 For more information about Portsmouth's Historic Dockyard please click here.